Grapes are a beautiful fruit with an impressive ability to mirror the best of what life has to offer, and the best that we should offer life. Grapes are complex, fun, giving, and unique; they can bring depth to our thoughts, that is, if we choose to learn from them. Grapes come in all different shapes, colors, and taste. There are the large, seedless green or red Thompson grapes that we find at the grocery store. Firm and sweet, they come in large bunches and enjoy an incredible sweet, juicy taste that kids and adults love. Then there is the concord grape; almost perfectly round with a skin of deep purple, filled with sweet juicy pulp, and large hard seeds. Good for eating, but sloppy at the same time. Grapes destine to participate in the noble art of wine-making are typically smaller in stature than the more numerous seedless Thompson, but they compensate for their small size and relative scarcity with an abundance of sugar. Wine grapes are sweet for their size, the clusters are tight and small; proudly hanging in bright purple or deep green bunches. These special grapes lead a life of pampering, often in a harsh manner, with a single goal at maturity of maximum flavor for the intended varietal. A pampered life can be harsh because the vine living in a rocky terrain, fighting for soil and water to survive can create the best tasting wine. The landowner knows ultimately what is best for grape, even if it appears unfair and cruel. Some grapes live in rich soil, and are given ample water – these produce fine wines as well. Sweet dessert wine, dry Cabernet, bold Zinfandel, or buttery Chardonnay: each grape has a different destiny and purpose. 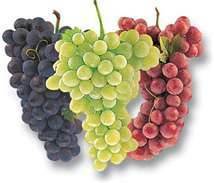 Other grapes can become lunchtime nutrition for the third grader, or a refreshing drink at home. Grapes can be large or small, of many different colors, and are destined to become part of a snack or an expensive wine. In each case the grape has an important purpose, with a noble aim and beneficial role in the cycle of life. And so it is with people. We come in large and small packages, in many differing colors, fulfilling a wide array of positions in society. None more important than another and all needed to complete the whole. The fulfillment of our place in life comes not from becoming the “most important grape,” but from recognizing that the landowner (God) knows our true destiny. He planted and watched us grow, so He knows best the varietal of grape we are intended to be. If we were planted as a Thompson, we cannot become a Merlot. When we let Him cultivate us to maturity, becoming the grape that He intended, even if that means living in rocky soil, then we will eventually find the true peace that is ours to own. It is His gift to us. This entry was posted in Living a Christian Life, Where Are You Going Today and tagged color, difference, friend, grapes, Heaven, love God, similarity, Simplicity, trust, Wisdom by Michael Obermire. Bookmark the permalink.